It’s almost October, and we’re getting in the pink! We’re gearing up for our biggest fundraising month of the year! Please join us for BC4BC 2013 on 19th October, our target is to get 250 people on board this year. Registrations have now opened. We have already confirmed corporate sponsorship for the event to the value of $7000 thanks to local businesses. We’re encouraging you to register early for the event and then raise as much as you can in personal sponsorship, everyone who raises over $100, will go into the draw to win a three course meal for two, with wine, at Hopgoods! 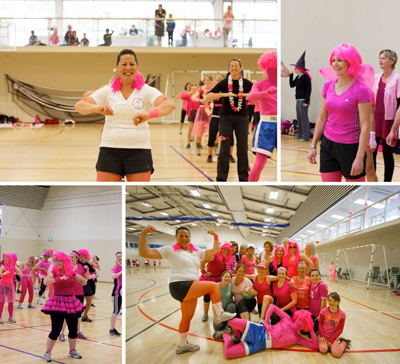 Remember BC4BC is suitable for all fitness levels, with the emphasis very much on having fun and dressing in pink! 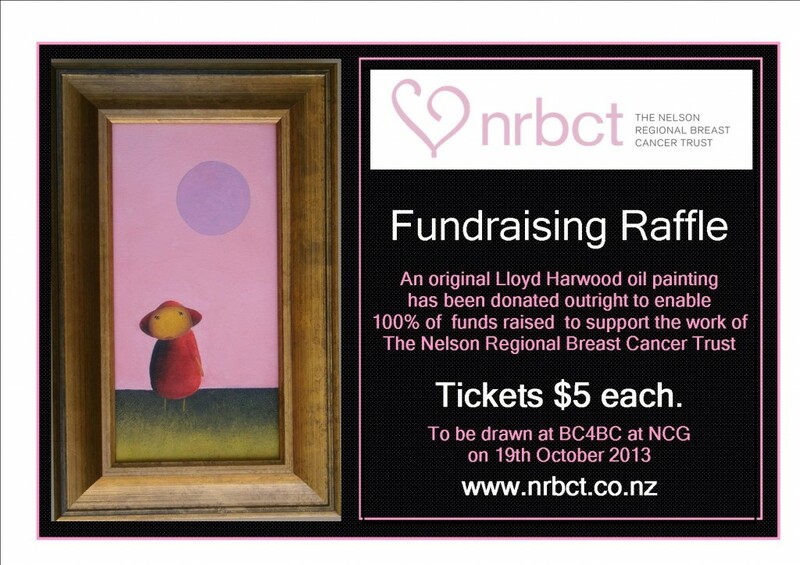 Tickets are also on sale at JAYS & KO for our annual raffle of a wonderful Lloyd Harwood painting! Thank you Lloyd for the kind donation! We have a winner, or two! Congratulations to our lucky pink October artwork raffle winners! The draw for two fabulous prizes was drawn on Sunday 28th October at the end of Boot Camp for Breast Cancer. 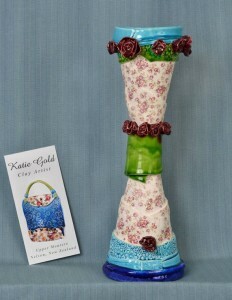 Mrs Sue Baigent was the winner of the Katie Gold sculpture, with Mrs Lauren Lewis winning the Lloyd Harwood painting. October 2012 – $20,000 raised! We’re pleased to announce that throughout October 2012 the trust has raised approximately $20,000! The annual Boot Camp for Breast Cancer has raised over $13,000. Further funds were raised from Pink is Infashion, held at Jays on Bridge earlier in the month and from other donations, including funds raised from the auction of a custom designed Benjamin Black ring. All of the money we raise goes directly towards helping local patients and their families, so we would like to express our heartfelt thanks to everyone who continues to support the trust, we couldn’t have done it without you. 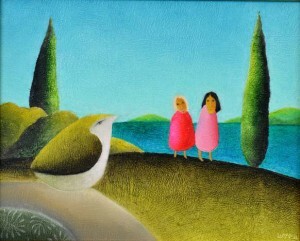 We’re so fortunate to have support from fabulous local artists Lloyd Harwood and Katie Gold. This October we have $5 raffle tickets on sale for a specially commissioned painting by Lloyd and a gorgeous Katie Gold candle holder. These are available from Jays on Bridge, Foxy Lady, Nelson and Shine on Hardy St. Or contact us directly through this website or our facebook page to purchase. Tickets will also be available at our two upcoming events Pink is Infashion and Boot Camp for Breast Cancer 2012. Raffle tickets on sale now. 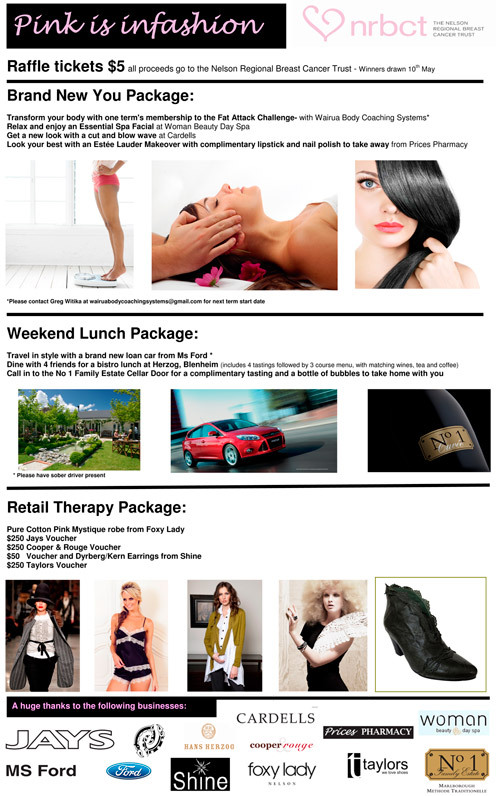 The Pink is infashion event takes place on Thursday 10th May, in association with this event we are holding a raffle. Tickets cost $5 each and there are 3 FABULOUS prizes up for grabs! You don’t have to be attending the event to purchase a raffle ticket, please contact us if you would like to buy, and we can arrange this.